Mrs. Miniver (1942): Dir. William Wyler. Written by: Arthur Wimperis, George Froeschel, James Hilton, and Claudine West. Based on the book of the same name by Jan Struther. Starring: Greer Garson, Walter Pidgeon, Richard Ney, Teresa Wright, and May Whitty. Unrated. Running time: 134 minutes. A sort of Battleship Potemkin for the American World War II crowd, William Wyler’s first Best Picture winner gained notoriety as a political plea for American support in war-torn Britain. That’s not an ignoble goal, but it means the film tends to favor cheap pathos at the expense of authenticity. 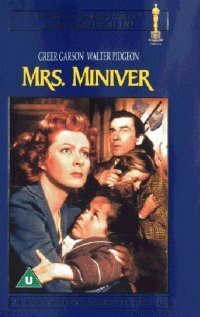 Despite its namesake, the film really concentrates on her family, with Mrs. Miniver (first name Kay) acting as a kind of anchor. From pre-war frivolities to the height of a blitzkrieg, the Minivers aim to protect their dignity as well as their lives as they confront war right on their doorstep. My biggest problem is with the film is the propaganda angle. That wouldn’t be a problem in itself, but it also means the story we watch feels very artificial—characters are designed to be generic, and they’re about as interesting as generic can be. Still, we do have a strong performance from Greer Garson in the title role. With her intense stare and warm presence, she bolsters the family through thick and thin. Unfortunately, most of her supporting players are fairly forgettable. In addition to its rather dull set-up, the plot suffers from groan-worthy contrivances. Right after proposing to his girlfriend, Kay’s son Vin is immediately called into action by the RAF. Another circumstance pits Kay against a wounded German pilot who just happens to have crash-landed outside her door. And if you’re expecting to see a sympathetic portrayal of a Nazi soldier á la The Pianist, you should probably just watch The Pianist instead. Even so, the film manages some intense scenes in its second half, including one scene in which the Minivers hunker down in a bunker as German bombs explode around them. I wish the film had realized that gritty depiction more fully, instead of succumbing to blatant propaganda.